Car Seats 9mths to 4yrs. Cot, Cotbed, Junior Bed, Bedding. Footmuffs, Liners & Pram Sets. Glider Cribs & Rocking Cribs. Muslin Squares, Swaddling & Bibs. Nursery Furniture & Room Sets. Pram, Moses Basket, Crib Bedding. Safety Gates/ Fireguards & Room Dividers. Sleeping Bags & Sleeping Suits. Soft toys & Baby comforters. Activity Toys & Dolls Prams. Mini Uno Stride Gemm Travel System - Grey Melange. 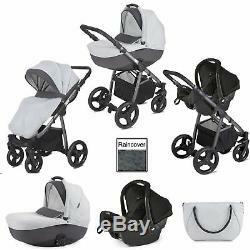 Pushchair Carrycot 0+ Gemm Car Seat Changing Bag Footmuff Raincover Maxi Cosi Adaptors. With a fully loaded package which includes pushchair, carrycot, car seat, changing bag, footmuff and raincover, youll be all set and ready to roll with the Stride Travel System from Mini Uno. This top quality travel system offers suitability from birth and features an easy lock-in system which provides easily interchangeable components (seat unit, carrycot, car seat) which can all be secured to the the beautiful aluminium chassis. With the attachment of the carrycot, you can create a wonderful lie-flat pram for your little one. Due to the clever design and its impressive ventilation and breathability, the carrycot is suitable for occasional overnight sleeping which is great for short trips away. The inclusion of the adaptors and Joie Gemm 0+ car seat means that it is no longer necessary to wake baby up when transferring them from vehicle to stroller(and vice versa). The 5-point safety harness keeps the torso positioned safely in the middle of the seat at all times and the (removable) newborn pillow provides a perfectly snug fit for younger / smaller babies. When your child is slightly older, the seat unit can be connected to the chassis and made to face either forwards or rearwards (parent facing) so that you can keep a constant eye on your little passenger. The seat unit can be reclined to multiple positions and the footrest is also adjustable so that you can find the optimum ride configuration for your child. For the parent, the Strives handle is made from a luxurious eco-leather fabric and a large shopping basket is also included for your convenience. Package Includes: Mini Uno Stride Pushchair Mini Uno Stride Carrycot Joie Gemm 0+ Car Seat Mini Uno Stride Footmuff Mini Uno Stride Changing Bag Mini Uno Stride Raincover. Swivel wheels and reversible seat unit. Eco leather handle on chassis. Easy lock in system for pram, seat and car seat. Adjustable footrest and backrest in seat unit. Includes changing bag, footmuff and raincover. Pushchair also compatible with Joie Gemm Car Seat and Maxi Cosi Car Seat. Please Note ex-display means this item is new & unused and may show signs of slight marks and usage on the wheels due to demonstrations in store. Suitable from birth to 13kg/29lbs. Attaches to other pushchairs using a Maxi-Cosi® car seat adapter. Side impact protection gives optimal security against side impact. Provides wrap-around coverage for the head and upper body. Multi-position, ergonomic carry handle with TPE overmold for optimum comfort. Padded harness cushions and lower buckle cover for babys comfort. Curved base allows for rocking and relaxing. 5-point harness system with front tension adjustment. Cosy, newborn pillow gives a perfect, snug fit for newborns. Airline Certified so you and baby can always travel with ease. Mini Uno Stride Stroller 111 x 60,5 x 112 cm [L x W x H] Mini Uno Stride Carrycot (internal dims) 76 x 35 x 23 cm [L x W x H] Mini Uno Stride Pram 106 x 60,5 x 126 cm [L x W x H] Joie Gemm Car Seat Weight: 3.4kg. Orders received by Online4baby are kept open / held for a maximum of 7 days. Therefore we cannot guarantee the availability of stock for orders which have been placed, but cleared funds have not been received. We do not store any personal information in accordance with the Data Protection Act 1998. We also accept cheques and postal orders. These should be made payable to Online4baby Ltd and sent to the following address: Online4baby Ltd, Unit B Broadgate, Broadway Business park, Chadderton, Oldham, OL9 0JA. This confirms that your item has been paid for in full, dispatched and is in the hands of our courier. At Online4baby we aim to deliver your order in the quickest possible timeframe from the point your order has been accepted. Also please allow 1 extra day (see individual Courier tabs for postcodes). England, Wales, Scotland (Excluding postcodes in the Scottish offshore Islands). These area's do not incur a surcharge but take 1 extra day to standard deliveries in the UK. Postcodes which are Out of Bound Areas. HS1-9, IV1-3, IV10-28, IV30-32, IV36, IV40-49, IV51-56, KA27-28, KW1-3, KW5-17, PA20-49, PA60-78, PH17-26, PH30-44, PH49-50, ZE1-3. This excludes bank holidays There are no collections or deliveries on bank holidays. However, due to circumstances beyond our (and their) control, such as extreme weather conditions, security checks, unforeseen incidents, miss-route of parcels, delays may occur. If you are working to a set deadline e. Holiday departure, a birthday please allow for extra time to cover any eventualities that may arise. If it is not possible to leave the parcel(s) with a neighbour or if they think there is not a safe place to leave it, the Postman/Postwoman will Card the address and take the parcel(s) back to the local depot where you will have 15 days to collect it. Usually the local Depots are open from 8am to 8pm. All Items (excluding the below). Wood Items which include two boxes e. 2 or 3 Piece Nursery Room Sets(4 or 6 Boxes). Our courier will endeavour to deliver your order within the timescale stated in your order acknowledgment. Please note our courier DPD cannot leave goods without a signature. Note this service is only available for standard UK mainland deliveries. We strictly do not allow customer pick-ups. A pre-order item is a high demand product which Online 4 Baby have secured from the manufactures but not yet received. The dispatch date to you is always highlighted within the listing. Charges Vary on how many pieces. A Contact telephone number must be provided to Online4baby when placing an order. England Wales Scotland (See other sections for areas which do carry a surcharge). Scottish Highlands & Islands AB30-31, AB33-38, AB41-45, AB51-56, AB63, DD8-10, FK8, FK17-21, IM1-9, IM99, IV1-28, IV30-32, IV36, IV40-56, IV63, KA27-28, KW1-3, KW5-14, PH10-11, PH13-14, PH19-26, PH30-44, PH49-50, TD15. HS1-9, KW15, PA20-49, PA62-78, PA80, ZE1-3. Scottish Highlands & Islands IV, HS, KA27-28, KW, PA20-49, PA60-78, PH17-26, PH30-44, PH49-50, ZE. It is important to note, within minutes that cleared funds have been received, goods are instantly released to the distribution centre, immediately processed and then dispatched with our courier. The right to cancel is a no fault cancellation. Collection charges are shown in the table below. It has taken over 25 years for Online4baby to develop into what we know it as today. Welcome to the Online4baby Ltd Terms & Conditions of Use. The term'you' refers to the user or viewer of our website. The item "MINI UNO GREY MELANGE STRIDE TRAVEL SYSTEM PUSHCHAIR WITH JOIE GEMM CAR SEAT" is in sale since Monday, December 17, 2018. This item is in the category "Baby\Pushchairs, Prams & Accs. The seller is "online4babyltd" and is located in Oldham.